In this second installment of our series exploring the tools and technologies used in the field of conservation, we will head to The Center's fourth floor lab to learn more about one of the major pieces of equipment used by the team: our custom-built water washing and light bleaching station. 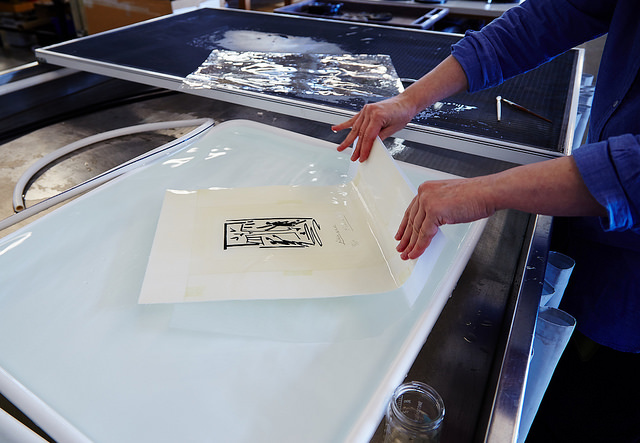 The station allows the conservators to reduce staining and discoloration in paper pieces and textiles without the introduction of potentially damaging chemicals. Our station has two parts, a sink area with monitored filtration and temperature control for water washing, and a light bank for light bleaching. The water bathing of paper pieces and textiles works to remediate staining by neutralizing the pH of pieces. 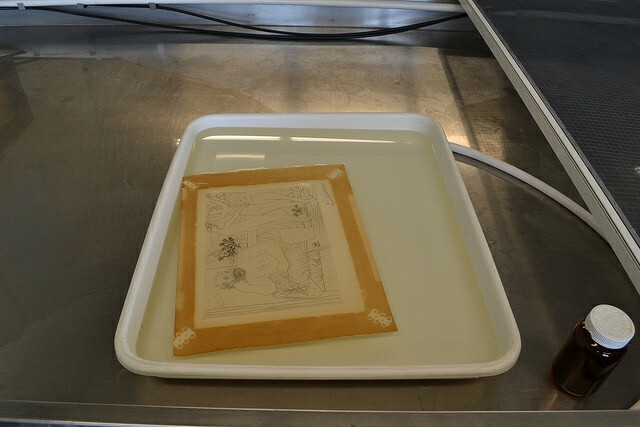 The processes of water bathing and light bleaching can vary from treatment to treatment, with our conservators relying on their prior knowledge and experience to diagnose the correct procedure used for each piece, and are only used in instances where the media allows for such processes. Our station is also used in triage situations when paper pieces have been damaged, often through natural disasters or fire exposure, and require immediate attention by our conservators to remediate the damage. Through the use of the water washing and light bleaching station our conservators are able to reduce staining and discoloration, sometimes with dramatic results. In the video below, watch the step-by-step process undertaken to treat a single piece.